Oh Broome—you drowsy, intoxicating beast you. There is probably no better feeling in the world than watching a Broome sunset with a Matso's beer in hand and it seems like a whole lotta other people agree. Famous for the 22km long Cable Beach (which is every bit as spectacular in real life as you would think), Broome is beautiful, laid-back and rugged, oozing outback Australia vibes in spades. Originally founded as a pearling port, this tiny, remote town 2,400km north of Perth is also like no other town in Australia. With its quirky history, red dirt, turquoise waters and fiery sunsets, Broome is a pretty bangin’ location for a cheeky weekend escape. Lucky enough to be visiting soon? Here’s how you should spend 48 hours in Broome. 5pm Flying into Broome is a majestic experience but it’s the airport—seemingly a big country shed—which is the dead giveaway that Broome operates at a different, slower pace. There are a plethora of spots—new and old—to stay but for the authentic Broome experience (and cos it’s the only hotel right on Cable Beach! ), Cable Beach Club Resort & Spa is perfect. Warning: you may get lost—this place is huuuuuge with five restaurants, two huge pool areas, tennis courts, mini golf, a spa, yoga studio and a variety of different rooms. The resort has recently undergone a big reno and really is the perfect mix of luxury and relaxed style. 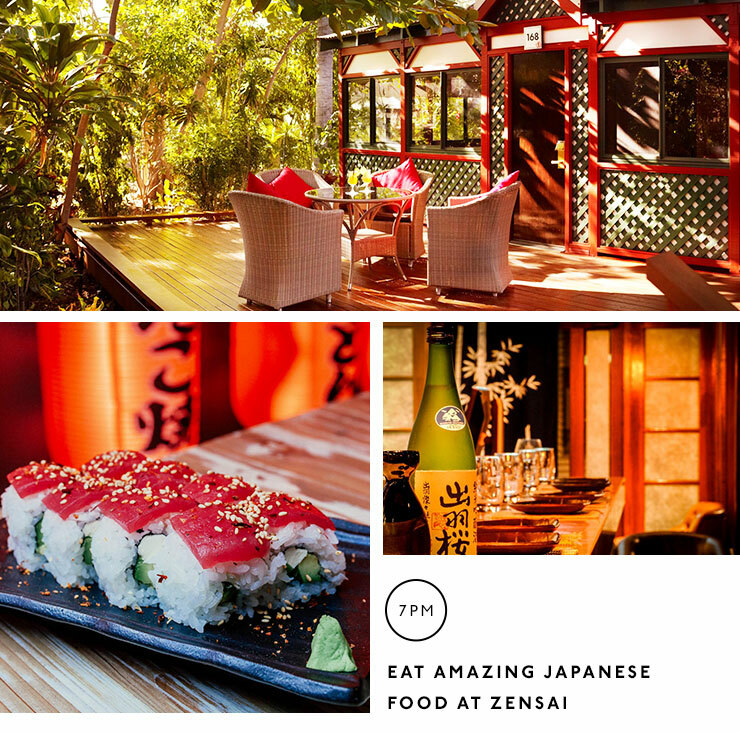 7pm Before you jump into your super comfy bed, have a wander around the resort and then walk over to Zenzai, one of the resort’s restaurants which also happens to dish out some of the best food in Broome. Executive Chef Joji Iwama is in his element here—offering plenty of traditional Japanese plates like sashimi, tempura, yaki-tori and yaki-ton. The food is fresh, tasty and authentic. 7am If you can manage it, get up early (especially if the weather is hot!) and go for a long walk on Cable Beach. It’s a magical time of the day and a bit of exercise will make you feel less guilty about all the delicious noms you’re going to eat later! If you’re up for the challenge, walk the 7.7kms to Gantheaume Point—the stunning red rock cliff face at the southern end of Cable Beach—for an epic Insta opp. It’s one of the most stunning vistas in Broome and if you get there at low tide, you’ll also see 120 million year old dinosaur prints. For realsies! 10am It’s brekky time and you’re ravenous right? 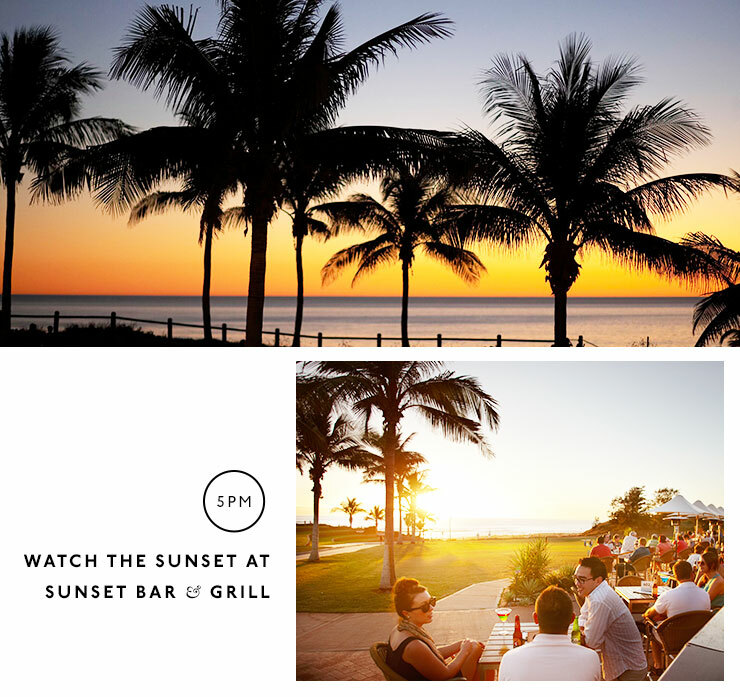 Jump on the Cable Beach Resort shuttle at 10am (there’s two every day) and you’ll get dropped off 100m from The Aarli, one of Broome’s best restaurants. The coffee here is delicious and strong and the Asian-style brekky menu is on point. The miso scrambled eggs and lap chong omelette are classic dishes, but if you’re starving (ie: you did the walk I suggested), go for the breaky roll—with beef brisket, sriracha hollandaise, cheddar and slaw. It’s scrumptious. 12 noon During the heyday of Broome’s pearling industry, the pearlers (many from China, Japan, the Philippines, Indonesia and Europe) would arrive back on shore cashed up and head to the opium dens and billiard halls of Chinatown. These days, this area is Broome’s main shopping district and it’s an intriguing mix of colonial and Asian architecture with an even more intriguing mix of shops and galleries. Have a wander, look at some Aboriginal art (or splurge on some! ), buy a pearl if you’re feeling cashed up and get into the Broome spirit. 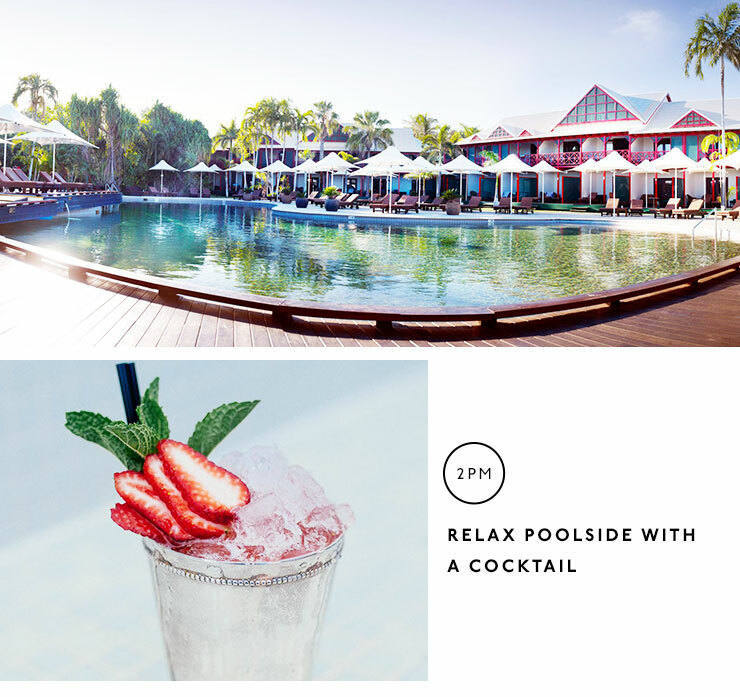 2pm It’s time to make use of the beautiful Cable Beach Club resort facilities. Can I interest you in some pool time and a cheeky cocktail? How about some mini golf or a hit of tennis? Or maybe a treatment at Cable Beach Resort’s gorgeous spa Chahoya? Thought so. 6pm One of the most gorgeous spots in Broome, the red earth, dark green mangroves and the sparkling waters of Roebuck Bay make the Mangrove Hotel one of Broome’s most picturesque spots. Plus it’s the best possie in town to watch the Staircase To The Moon which happens several times throughout the year during a full moon as it rises over the exposed tidal mudflats of Roebuck Bay and looks like a staircase rising to meet the moon. Order some drinks, get some food (the menu here is delish! ), chill out to the live music and enjoy. 10am Jump on the shuttle bus again, it’s market time! The Courthouse Markets have been a fixture in Broome for more than 20 years, operating weekly on Saturdays and Sundays (from April to October 8am to 1pm) and the stalls are an eclectic mix of food, local photography, handmade clothing, toiletries, crystals and art pieces. My tip? Try the fresh mango smoothie at Ra Ra’s and then follow it with a Kimberley Coffee Co coffee and a bowl of dumplings. Yum. 12 noon Ok, it’s officially the afternoon which means beer time! And not just any beer time. Matso's beer time. A Broome treasure, this microbrewery started life as a bank in 1910 and is one of Broome’s most-loved institutions. Sitting under a shady tree in the Matso's garden with one of their icy cold ginger beers is Broome in a nutshell. 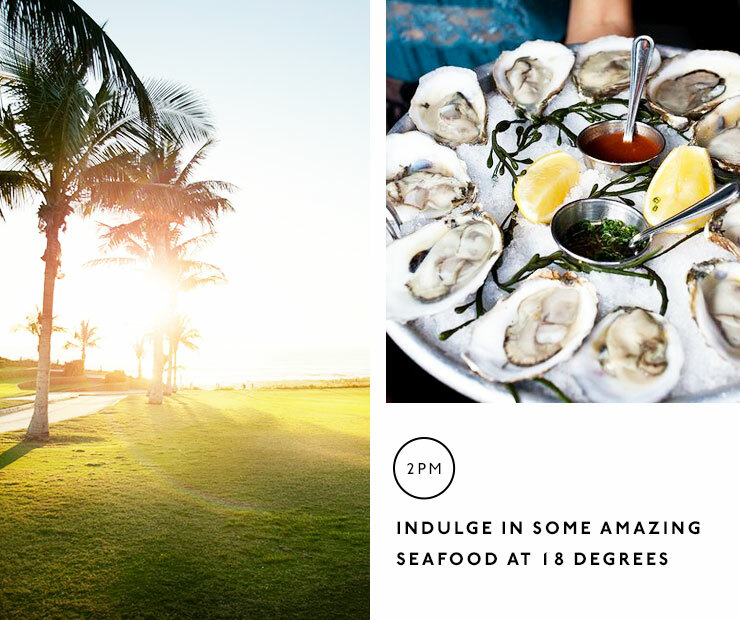 2pm One of Broome’s best restaurants, you can’t leave town without indulging in a meal at 18 Degrees. The share plates are where it’s at here and you’ll have a hard time choosing between seafood dishes like scallops ceviche, tiger prawns and herb crusted barramundi or meaty dishes like seared beef, lamb rump and pork fillet. It’s all good so try as much as you can! The cocktails here are pretty next-level too. 5pm Your time is nearly up and it’s time to (reluctantly) head to the airport for your flight home. 'Til next time Broome! Broome is tropical and can get super hot so prepare to sweat and spend the entire day in the pool if you time your visit wrong! The humid, wet season runs from November to April but during Broome’s winter (May to October) you’ll get dry, perfect summer-like days and cool evenings. Broome Time is a real thing! Everyone is super laid-back and shops will often open and close at different times than they advertise. It’s best to just relax and go with the flow! Get a car or plan your activities around the shuttle bus or local bus timetable. Cabs are expensive and can be unreliable! The local bus is great and the bus driver may even give you a history lesson at the same time! Watch the sun set. I promise for as many nights you are in Broome, you will never ever get sick of this! Visit Sun Pictures. It’s the world’s oldest operating open-air theatre and in total Broome style, the perfect spot to kick back to an old-school flick. See a Staircase To The Moon. If you can time it, this natural phenomenon is magical! Have A Beer At Matso’s. It’s Broome in a nutshell! Wander through the markets. And talk to all the locals, they always have great stories and good local tips. Go on a tour. 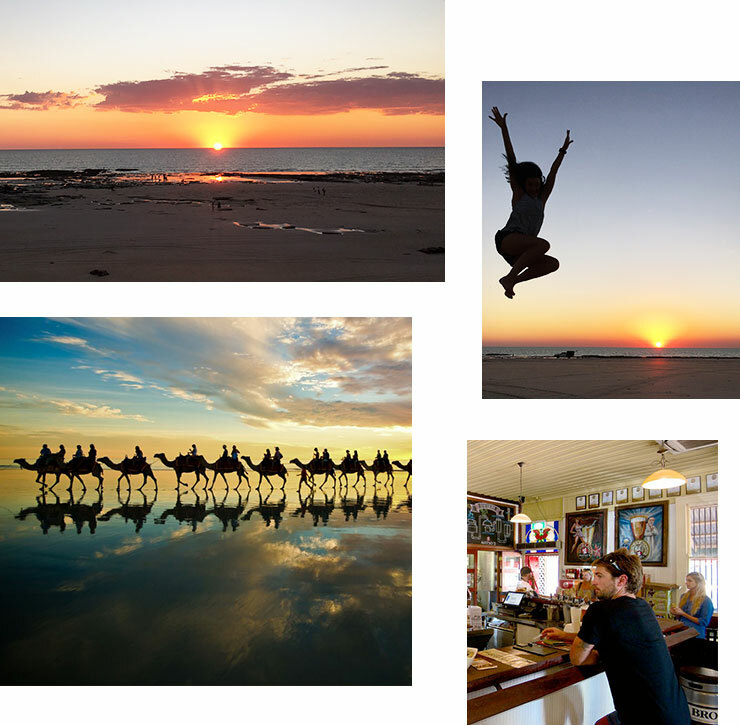 Whether you’re into fishing, flying, pearls, whales, anatomy or the outback, there’s a tour in Broome for you! #1 This Zimmerman playsuit will take you from hot days to balmy nights like a boss. #2 This aint the place for heels! These gorgeous K Jacques sandals are the only shoes you'll need all weekend. #3 Don't go anyhere in the Broome heat without a hat! This Lack of Colour boater will keep you stylishly covered. #4 This SPF 50 will save you from getting frazzled in the Broome heat. #5 From the pool to the beach, this Seafolly towel will be a classic companion. #6 You'll live in this Triangl bikini all weekend. #7 Keep cool in the glare with these cat-eye shaped Celine shades. #8 Long days by the pool and at the beach require a tote for all of your things and this Kayu seagrass tote will fit errythang. Looking for more travel inspo? Here's How To Have A Rockstar Weekend In Seminyak!